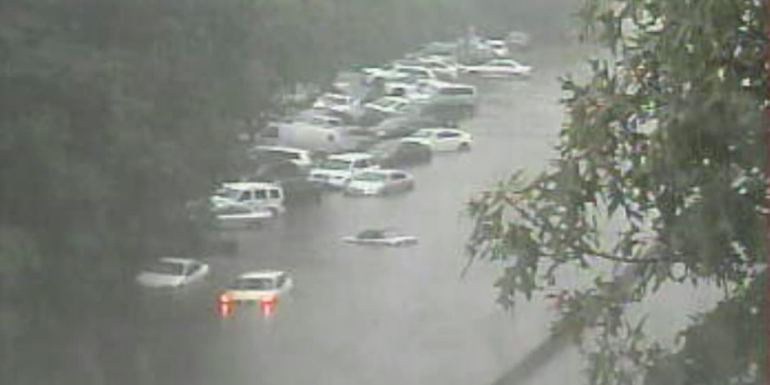 Record rainfall swamped New York’s Long Island on Wednesday morning. Flash floods prompted evacuations, submerged cars on major roadways, and even uprooted trees. Local officials have also reported one weather-related death. One of the hardest hit areas was Islip in Suffolk County, where 13.27 inches of rain fell in less than 24 hours. That is more than the town would normally get for an entire summer season and is nearly double its previous daily record of 6.7 inches set in August 1990. The storm also shattered the record for 24-hour rainfall in New York State. The previous record was 11.6 inches, which was measured in Tannersville, NY during Tropical Storm Irene in August 2011. The intensity of this rain event, according to the NWS, was caused by a few factors. First, several different weather systems came together over Long Island and were fed by moisture from the Atlantic Ocean. Then, the storm essentially stalled in place for hours. While Suffolk County bore the brunt of the rain, flash flooding also caused problems in nearby sections of New Jersey and Connecticut. Here in New York City, we were mostly unscathed. JFK airport (in Queens) reported 3.2 inches of rain, but less than an inch was measured in Central Park. This entry was posted in weather and tagged floods, rain, record, storms by Melissa Fleming. Bookmark the permalink.